Andre Green is in Pompey's team to face Gillingham tonight. Picture: Portsmouth FC. Andre Green has been handed his Pompey bow in tonight’s clash with Gillingham. The loanee from Aston Villa is among 10 changes implemented by Kenny Jackett in the Checkatrade Trophy clash. There’s also a first start of the campaign for Danny Rose, a maiden appearance of the season for Adam May, while David Wheeler is also involved. Matt Clarke is the sole player retaining his place from the side which defeated Plymouth 3-0 last weekend. Meanwhile, Joe Mason is among the substitutes as he seek his first outing since arriving on loan from Wolves. However, there is no place in the squad for Louis Dennis. 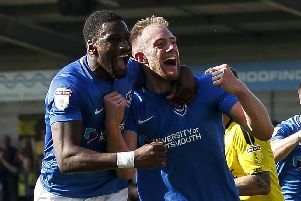 Pompey: McGee, N.Thompson, Burgess, Clarke, Haunstrup, Rose, Close, Wheeler, May, Green, Pitman. Subs: MacGillivray, Brown, Naylor, Lowe, Mason, Evans, B.Thompson.